Trixie Dog Bed Love is a beautiful dog bed with a fun text on the side. This bed is isolating, dirt-repelling and strongly shaped thanks to the reinforced edge. The beautiful grips on the side ensure that you can easily move the bed. 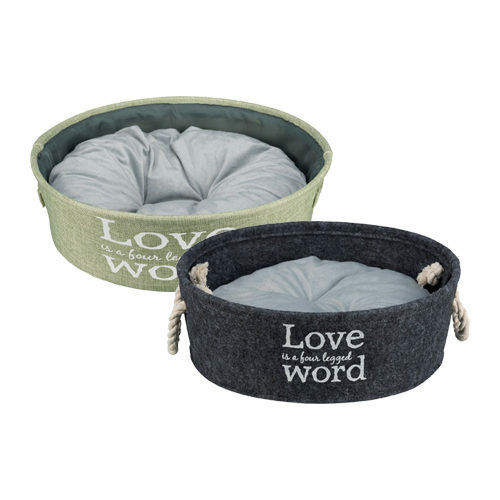 Trixie Dog Bed Love is a fun dog bed made from durable polyester. The dog bed has a fixed shape, thanks to the reinforced edges and is isolating as well as dirt-repelling. The pillow in the bed has a plush cover and polyester fleece filling. The pillow is hand washable at 30 degrees. What's more, this beautiful bed has the lovely words ''LOVE is a four legged WORD'' printed on it. The strong, twisted cotton grips ensure that you can easily move the bed. Have you used Trixie Dog Bed Love before? Let us know what you think about this product.